I’ll be honest here, I usually make tomato-based salsa because that’s what I personally enjoy. When it comes to salsa, I tend to prefer a smooth tomato base with some onions for texture and some sweet zip from a crunchy jalapeno. Since red salsa is what I tend to like to eat, it’s also what I tend to make. The only issue with having tubs of delicious homemade spicy goodness stacked in the fridge is that my wife – while appreciative of my amateur affinity for the culinary arts – seems to NOT prefer spicy red salsa. This, in itself, isn’t a big deal. I consume enough salsa weekly to stock the tables of a small to medium family-style Mexican restaurant, and I tend to grab a jar or two each of cowboy caviar and green salsa for Krystle (and to have a little variety) when I’m at Trader Joe’s. Note to self: Come up with a good recipe for cowboy caviar. 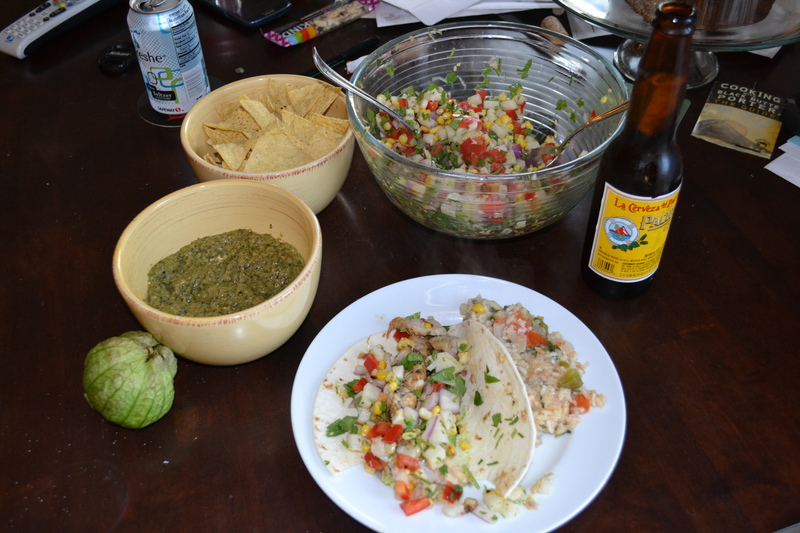 So, when I made the decision to go all-in with my Mexican-inspired recipes this passed Cinco de Mayo, I chose to include a green salsa – a first for me – on my list. I based my shopping list on a handful of recipes that I had read online, but unfortunately forgot them in the printer on my way to the store. I remembered the tomatillos, serrano peppers, cilantro – of course – and oregano, so I had a good base to build upon. I started by husking and cleaning the tomatillos, slicing them in half, and tossing them in oil, salt and pepper with the onion – which I quartered. As we all know, everything is better grilled, so the oil-coated veggies were destined for that magical cooking surface. 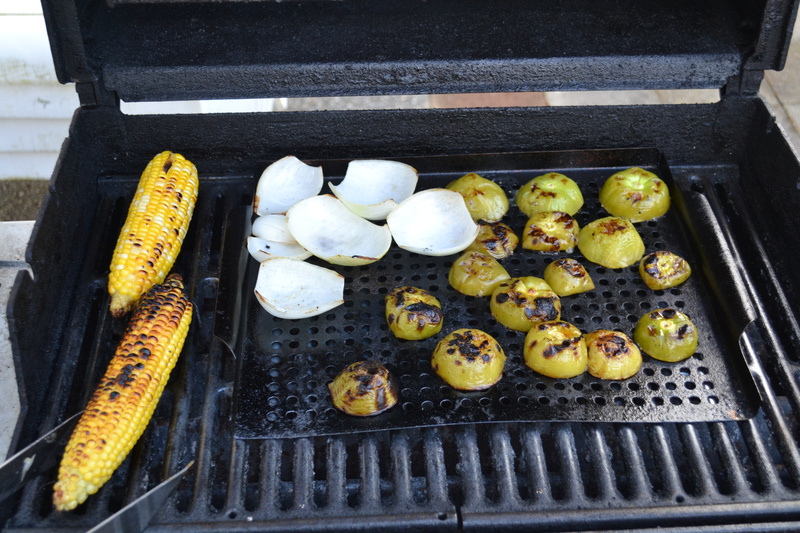 The tomatillos and onions went face down onto a cooking spray-coated veggie tray. I grilled them for six minutes on each side which gave the skin a nice char, and softened up the meat of the fruit. I flipped the onions at shorter intervals as the tomatillos were cooking. I then rough-chopped the ingredients, and pulsed them all together in the CuisinArt. The final result was a richly colored green salsa with a sweet and smoky flavor punctuated nicely by the fresh garlic and herbs. The oregano was a little too strong for my taste in this recipe. Were I to try to make it again, I would reduce the amount of oregano to somewhere around ½ to ¾ of a tablespoon. Serve as a side with corn chips, and a cerveza of course. This looks awesome – grilled veggies are the *best*. And my main grocery shopping MO is making a list of everything I need and leaving it conveniently at home. Last week I actually emailed it to myself so I’d have it on my phone (for all the nerd points). Glad you nabbed the ingredients you needed! If in doubt, buy more than needed. I’ve actually started using google docs for shopping lists and some recipes. Its nice to be able to access it on the computer and my phone.